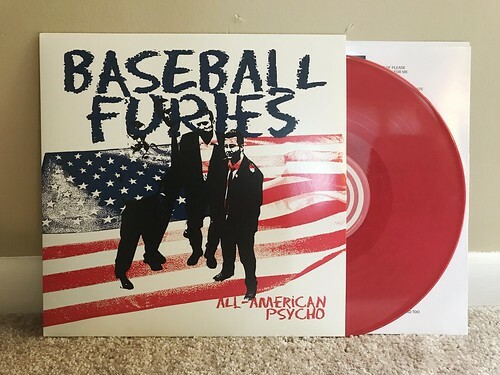 This Baseball Furies LP contains a previously released 10" and 7" onto one convenient piece of vinyl. Having not heard of the band prior to receiving this in the mail from Big Neck, I'm not familiar with the original formats so these songs were all brand new to me. I have to say that while this is better than many other bands of this ilk, I don't think it's really for me. The positives are in the music. The guitar riffs are fast and furious, with explosive garage energy and just the right amount of lead guitar licks. There's a little bit of a trashy 60s vibe to a lot of the songs, mixed with a more modern sensibility, but vocally it doesn't hold up for me. The vocals are really blown out and distorted in that way where the singer sounds like he's shouting from the confines of a cave. Sometimes this works, other times it doesn't and for my ears, there's just too much yelling on this album. If the vocals were taken down a notch, I think I'd be much more into this than I am. But again, this is a lot better than some of the other garden variety garage revival bands out there.